Who do Du think Georgie would make a cute couple with? Which role Did Georgie play the best? Die Fanauswahl: Lucy Pevensie in "Prince Caspian"
Did Du think narnia3 was better without peter and Susan? according to you, She's beautiful in which years and Fotos ? If i send a letter for Georgie to ask a signature will she resend it with her signature? georgie can Du keep some of your childhood Fotos here? Lately, I have had a lot of trouble with the Blue Peter screencaps I made of Georgie. People are confused about who made them. I spent hours making these screencaps, and then adding them to my website and to fanpop. (I run a site called Wonderful Georgie, which is currently moving domain.) So imagine how I felt when an argument broke out about them! Please, if Du want to take them for your website, feel free, but bär in mind how much effort these took. Please do not claim as your own. I saw the narnia 3 movie a few days ago. It was very nice.I liked the Schauspielen of lucy very much.Lucy displays the spirutual role of the book lucy very much.She doesnot boast a lot and just does her work seriosly.Also she is very kind.I like that about her.And I desperately want to meet her in reality. She is very pretty and a very good actress.I Liebe all of the narnia crew but she is the best.I would miss her very much in the Weiter narnia movie. I'm Schreiben this because there are so many Georgie fakes out there pretending to be Georgie, and I feel that the truth should be told. There are a number of fake Georgies on Twitter, Facebook, and Twitter. These are NOT Georgie! In an interview with Du magazine recently, she stated that she does NOT have a social network account although her friend Emma does let her use her Facebook occasionally. Just be aware of this Weiter time Du see a "Georgie" on any of these networks. Cos it won't be her. All i think of her,is that she's very nice and like to speak so much and so quickly! !Also she acts so well. One thing i liked very much:It's rare to see a little girl like this becoming a Queen,and not a princess,like her character does.It's such a unpredictable thing!! I loved to see her like a little child as many as a simple girl.She didn't change her personality anyway. 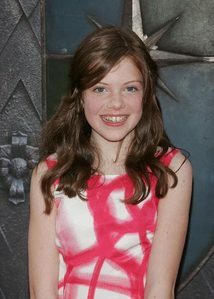 Georgie Henley stars as Lucy Pevensie in the third instalment of the Narnia Chronicles. On what datum was Georgie Henley Born?